Members of the media, including reporters, editors, producers, photographers and videographers, may apply to register for complimentary media registration to cover programs and exhibits at AUVSI Novus Unmanned. To maintain quality news coverage at AUVSI Novus Unmanned, applicants for media registration must meet the following criteria and present acceptable identification to be considered for a badge that provides media access. Media badges are for working members of editorial staffs at news organizations that will report on programs and exhibits at AUVSI’s Novus Unmanned. Freelance reporters and bloggers, including writers for college and university and organizational publications, and online news outlets and blogs, as well as photographers and videographers, must submit a letter of assignment from an approved media outlet to be granted a media badge. Letters of assignment must be presented if registering onsite. Applicants for media registration must provide their name, title, the name of the news organization they are representing, mailing address, email address and phone number when applying online in advance of the event. If registering onsite, they must present current media credentials issued by a local, state or federal government, or a business card listing the information described above. Advertising, public relations, marketing and sales representatives, and other non-editorial media staff will not be granted media badges and must register through attendee registration and pay appropriate fees. Also, non-credentialed companions of credentialed media representatives must register through attendee registration and pay appropriate fees. To apply online for media registration, click here. 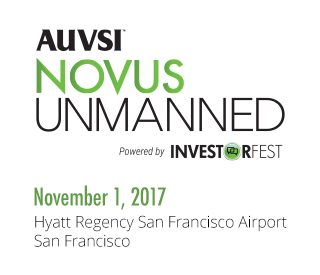 A government-issued photo ID (and printed registration confirmation sent via email after completing online registration) is required to retrieve media badges at AUVSI Novus Unmanned. It is also required to register onsite. Media badges will NOT be sent by mail or other physical delivery method.